Salman Khurshid seems to be enjoying his new position as the Minister of External Affairs, one of four CCS (Cabinet Committee on Security) ministries (the others are Home, Defense, and Finance). Notably, Khurshid’s promotion to the head of this key ministry has shielded him from having to engage in domestic political issues, which was a quite welcome perk for Khurshid in light of the amount of criticism he has faced as of late from activist-turned-politician Arvind Kejriwal. On Friday Khurshid held one of his first press conferences with print and electronic media outlets since taking his new position. The event, a breakfast at the Hyderabad House in New Delhi, was attended by some sixty journalists who endured the chilly weather and early hours in order to attend. The breakfast meeting signaled a changed public face for the former Union Law Minister. Throughout the hour-long conversation with journalists he was not asked a single question about Kejriwal, or about the India Against Corruption (IAC) leader’s accusations that Khurshid and his wife, Louise Fernandes, had misappropriated funds from their NGO. Kejriwal had gone so far as to visit Khurshid’s parliamentary district to expose him in front of his constituents, which had prompted Khurshid to threaten that Kejriwal might be able to travel to his district of, Farrukhabad, but there was no guarantee that he would be able to return (Khurshid would later say his statement had been taking out of context). Despite the fiery rhetoric Kejriwal’s November 1st rally in Farrukhabad was held without incident. During his breakfast with journalists, Khurshid was asked just one political question relating to the government’s decision of allowing Foreign Direct Investment (FDI) in multi-brand retail, which the minister dodged. 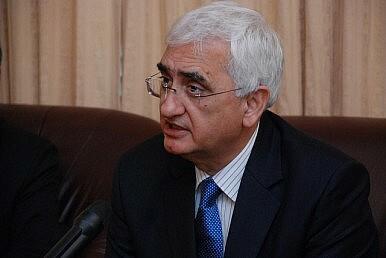 The message seemed unambiguous: Khurshid would not answer any political questions. Just hours later, however, Khurshid did entertain some political questions when he briefly met with TV journalists at his residence. The difference in the two settings being that in the latter he was asked for his views on Rahul Gandhi’s political future. Khurshid did not attempt to mask his eagerness to see Rahul take on a larger role and lauded the Congress Party’s decision to elevate Rahul as the head of its coordination committee for the May 2014 general elections. "Our party is very excited. Now it is clear who our commander is, whose footsteps we have to follow," Khurshid declared.